OPERATING RANGE :300 meters operating range in open area. Please note that some batch has no logo CACAZI on the product but some batch has, and the product will be sent in random. 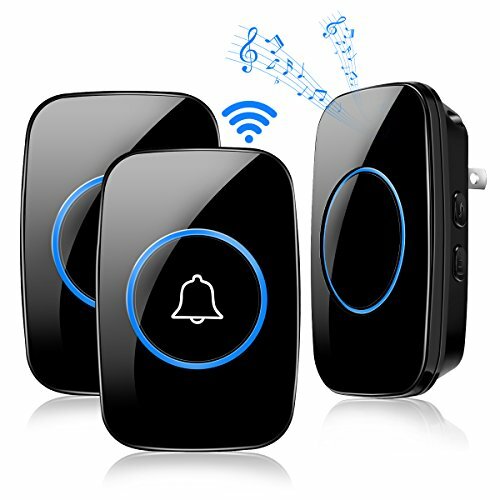 ★【High-quality sound】 It can be delivered by both wired and wireless doorbells. Some wireless doorbell systems offer frequency blocking technology, which blocks out background frequencies that can interfere with the doorbell signal caused by other devices like garage door openers and car alarms. ★【2 Receivers & Extend Range】 With 2 Receivers, You will never miss a visitor with wired doorbells, The wireless, long-range up to 1000 feet/300m. You can put it in your bedroom & Living room or anywhere which convenient for you. ★【Waterproof Transmitter】Our Smart Wireless Door Bell transmitter complies with the IP44 waterproof standard, no more worry about being exposed to extreme weather. But which will corrosion its case and reduce its lifespan, so recommend you install it avoid exposure to the rain and sun. The indoor sound volume can be adjusted to four levels, 38 different tunes for your choice(the first default ding dong). ★【Easy Installation】No batteries required for the receiver, just plug the receiver into an electrical outlet. The 12V 23A battery for the transmitter is included. the push button can be fixed to the door-frame with the attached adhesive tapes or using the screws and anchors which are included in the package. ★【Anti-interference System】 Avoid interferences between neighbors. Zero electromagnetic radiation, suitable for pregnant children and senior, enjoy the healthy life. Design with the stable transmission signal, fit for apartment, villas, home, office, hospital and many other places.